The unique properties of calcite make it suitable for a variety of uses. 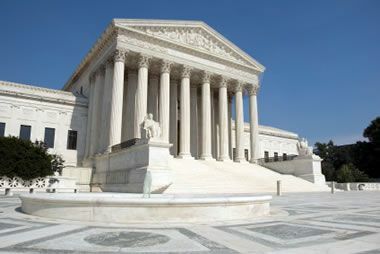 Calcite: Calcite in the form of white marble was the primary stone used in the Supreme Court building. Image copyright iStockphoto / Gary Blakeley. Calcite as pink marble: Calcite in the form of a pink marble from Tate, Georgia. This specimen is approximately four inches (ten centimeters) across. Calcite is a rock-forming mineral with a chemical formula of CaCO3. 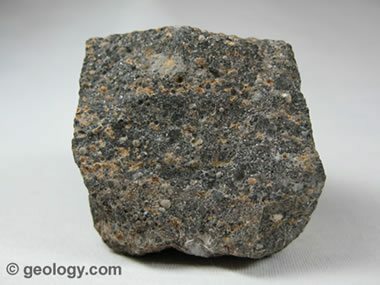 It is extremely common and found throughout the world in sedimentary, metamorphic, and igneous rocks. 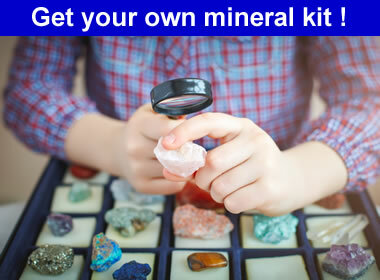 Some geologists consider it to be a "ubiquitous mineral" - one that is found everywhere. 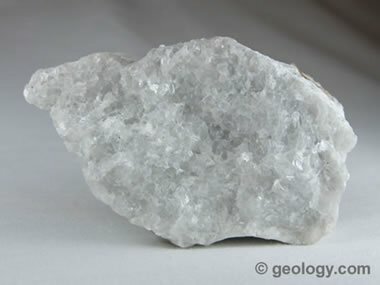 Calcite is the principal constituent of limestone and marble. These rocks are extremely common and make up a significant portion of Earth's crust. They serve as one of the largest carbon repositories on our planet. 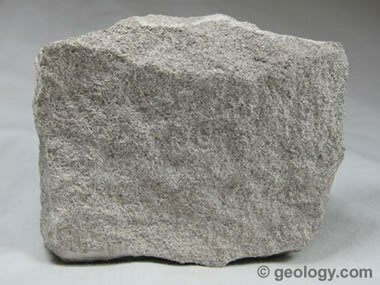 Calcite in concrete used in a high-rise building: Calcite in the form of limestone is used to make cement and also used as the aggregate in most concrete. A concrete slurry can be pumped or hoisted from the ground and poured into forms to produce the structural elements of buildings. Image copyright iStockphoto / Frank Leung. The construction industry is the primary consumer of calcite in the form of limestone and marble. These rocks have been used as dimension stones and in mortar for thousands of years. Limestone blocks were the primary construction material used in many of the pyramids of Egypt and Latin America. Today, rough and polished limestone and marble are still an important material used in prestige architecture. Modern construction uses calcite in the form of limestone and marble to produce cement and concrete. These materials are easily mixed, transported, and placed in the form of a slurry that will harden into a durable construction material. 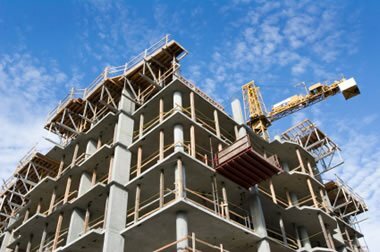 Concrete is used to make buildings, highways, bridges, walls, and many other structures. 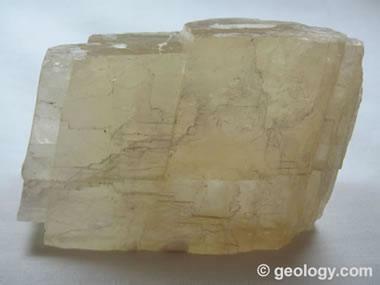 Calcite with cleavage: Transparent calcite from Baxter Springs, Kansas, showing characteristic cleavage. Specimen is approximately four inches (10 centimeters) across. Calcite as agrilime: Acid-neutralizing qualities of calcite make finely crushed limestone a preferred material for soil treatment. Image copyright iStockphoto / Krzch-34. Calcite as an antacid: The acid-neutralizing ability of calcite is used in medicine. 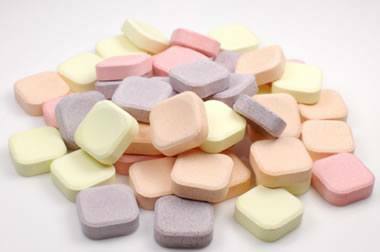 High-purity calcite was used to make these antacid tablets. Image copyright iStockphoto / Rudi Tapper. 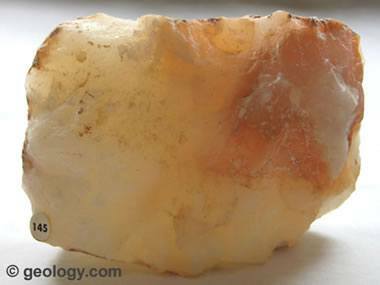 Calcite has numerous uses as a neutralizer of acids. 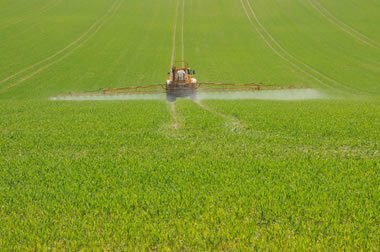 For hundreds of years, limestones and marbles have been crushed and spread on fields as an acid-neutralizing soil treatment. They are also heated to produce lime that has a much faster reaction rate in the soil. Calcite is used as an acid neutralizer in the chemical industry. In areas were streams are plagued with acid mine drainage, crushed limestone is dispensed into the streams to neutralize their waters. Calcium carbonate derived from high-purity limestones or marbles is used in medicine. Mixed with sugar and flavoring, calcium carbonate is made into chewable tablets used in the neutralization of stomach acids. It is also an ingredient in numerous medications used to treat digestive and other ailments. Sorbents are substances that have the ability to "capture" another substance. Limestone is often treated and used as sorbent material during the burning of fossil fuels. Calcium carbonate reacts with sulfur dioxide and other gases in the combustion emissions, absorbs	them, and prevents them from escaping to the atmosphere. 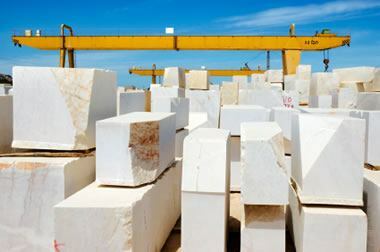 Calcite as marble blocks: White marble blocks for monuments or statuary, awaiting transport from a quarry in Portugal. Image copyright iStockphoto / Manuel Ribeiro. Marble is an attractive and easily worked rock that has long been used for monuments and sculptures. Its lack of significant porosity allows it to stand up well to freeze-thaw action outdoors, and its low hardness makes it an easy stone to work. It has been used in projects as large as the pyramids and as small as a figurine. It is widely used as cemetery markers, statues, mantles, benches, stairways, and much more. 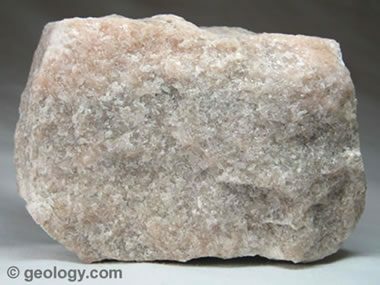 In a powdered form, calcite often has an extremely white color. 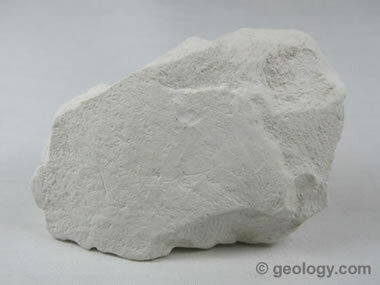 Powdered calcite is often used as a white pigment or "whiting." Some of the earliest paints were made with calcite. It is a primary ingredient in whitewash, and it is used as an inert coloring ingredient of paint. Pulverized limestone and marble are often used as a dietary supplement in animal feed. Chickens that produce eggs and cattle that produce milk need to consume a calcium-rich diet. Small amounts of calcium carbonate are often added to their feeds to enhance their calcium intake. Calcite has a hardness of three on the Mohs scale, and that makes it suitable as a low-hardness abrasive. It is softer than the stone, porcelain, and plastic surfaces found in kitchens and bathrooms but more durable than dried food and other debris that people want to remove. Its low hardness makes it an effective cleaning agent that does not damage the surface being cleaned. Pulverized limestone is also used as a mine safety dust. This is a nonflammable dust that is sprayed onto the walls and roofs of underground coal mines to reduce the amount of coal dust in the air (which can be an explosion hazard). The mine safety dust adheres to the wall of the mine and immobilizes the coal dust. Its white color aids in illumination of the mine. It is the perfect material for this use. Calcite as travertine cave formations: Calcite cave formations of Luray Caverns, Virginia, USA. Image copyright iStockphoto / Daniel Yost. Carbon dioxide is an important gas in Earth's environment. In the atmosphere it serves as a greenhouse gas that works to trap and hold heat near the surface of the planet. 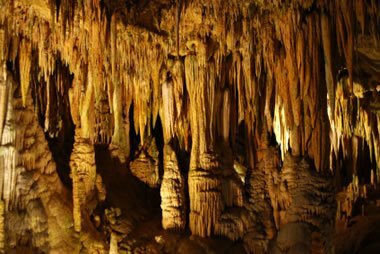 The process of limestone formation removes carbon dioxide from the atmosphere and stores it away for long periods of time. This process has been occurring for millions of years - producing enormous volumes of stored carbon dioxide. When these rocks are weathered, used to neutralize acids, heated to make cement or metamorphosed severely, some of their carbon dioxide is released and returned to the atmosphere. All of these processes of limestone formation and destruction have an impact on Earth's climate. 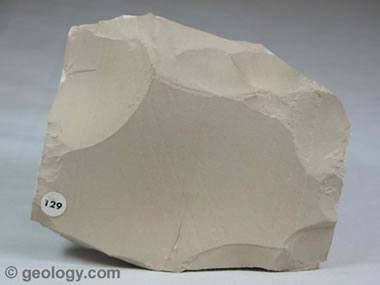 Calcite as lithographic limestone: Calcite in the form of lithographic limestone from Solnhofen, Bavaria, Germany. Note the fine, uniform texture that is characteristic of lithographic limestone. Specimen is about 4 inches (ten centimeters) across. 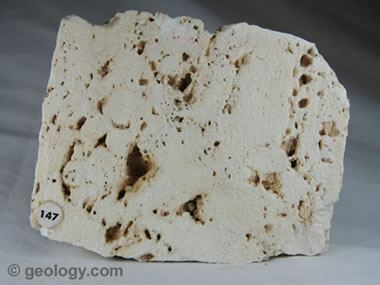 Calcite as oolitic limestone: Calcite in the form of oolitic limestone from Tyrone, Pennsylvania. This specimen is approximately four inches (ten centimeters) across. Calcite as translucent onyx: Calcite in the form of translucent onyx from Tecali, Mexico. Specimen is about four inches (ten centimeters) across. Double refraction in calcite: Transparent calcite (known as "Iceland Spar") from Chihuahua, Mexico. 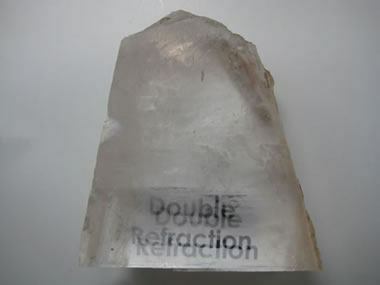 This specimen shows excellent double refraction. Specimen is about four inches (ten centimeters) across. 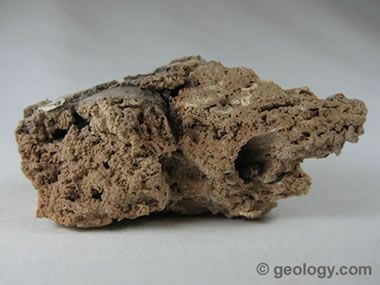 Calcite as calcareous tufa: Calcite in the form of calcareous tufa from Mumford, New York. This specimen is approximately four inches (ten centimeters) across. Calcite as travertine: Calcite in the form of travertine from Tivoli, Italy. Specimen is about four inches (ten centimeters) across. Picasso Stone: A variety of marble with brown and black markings is known as "Picasso Stone." 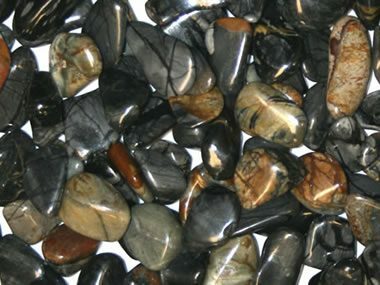 It is frequently cut and polished as cabochons or used to produce tumbled stones. It is popular for jewelry and ornamental crafts. White calcite as marble: Calcite in the form of white, coarsely crystalline marble from Tate, Georgia. Specimen is about four inches (ten centimeters) across. Calcite sand crystals: Calcite in the form of siliceous crystals from the Badlands, South Dakota. 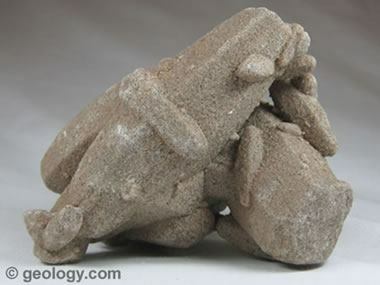 The calcite grew as crystals in a sand, including the sand grains within its crystal structure. Specimen is about five inches (twelve centimeters) across.